While Epiphany is the default browser of GNOME, and it’s a great browser (I use it from time to time), Firefox is still my brower of choice, especially since it’s so extensible. I think it would be interesting to extend the plugin to add a history observer that would log events to Zeitgeist… Zeitgeist already has a Firefox plugin, but unless it has been fixed since last time I checked, it’s not working with Gecko 2. 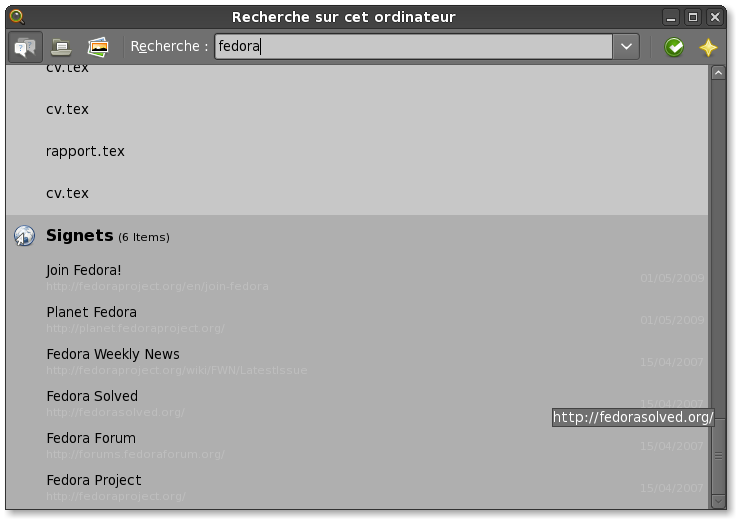 We’re in any case working more and more together with the Zeitgeist guys to make sure the Gnome 3.1 search experience will be greatly enhanced! I don’t think having C# running on many closed smartphones brings any credit to Mono (and don’t get me wrong, Mono is technically an awesome technology). Having Mono run on MeeGo (which is already possible) would have been much nicer, since it’d have meant both the developer’s and user’s freedom would have been preserved, at no technical expense1. Celebrating the “victory” of Windows Phone over MeeGo on Planet GNOME does not seem the wisest thing to me2 in the current context, but freedom of expression is one of the rights I respect the most, so how could I complain? 1 Actually, it would surely have been easier to install mono addons on MeeGo than it’ll be on Windows Phone. 1. Tracker’s ontologies are fixed (changes are supported in a limited way), which means you should stick to the installed data schemas (ontologies), as opposed to being allowed to store any triple in the database. 2. Tracker uses SQLite. On the good side it means Tracker is rather lite on the system resources (it usually idles at around 4MB RSS, and can go maybe up to 25-30MB when running a big query). On the bad side, it means that not every operation is fast, since SQLite is an on-disk database. As my job implies using Tracker on devices with not so much memory or CPU power, it is very important to know what is fast/expensive and what is not. And it is precisely what this post is about. Now, we have an OPTIONAL block, which makes our query slower. On this very precise example, the speed difference might be negligible, but I’ve already seen 10x speedups on some queries optimized to use as few OPTIONAL blocks as possible. In that case, the second columns in our results would be an empty string when there is no title. If this is faster, you might wonder why Tracker does not convert internally OPTIONAL blocks to predicate functions. The answer is, OPTIONAL blocks allow you to do more things, that are not always possible with predicate functions. When using an optional block, you define a sparql variable (?title in our example), which you can reuse in other patterns. This is not the case when using predicate functions. However, predicate functions don’t work on lists. That means if you have a chain of predicate functions p1(p2(…pn(?variable))), the query will only be valid if p2, p3…pn are single valued. My mail server uses a pretty standard setup to filter spam, that is Spamassassin. I get really good results, and use a SIEVE rule to move all the spams to a “Junk” folder. The funny part is that some mails started to end up in the “Junk” folder over the last two weeks, although Spamassassin hadn’t marked them as spam… It turned out that the X-Spam-Status header included the word “BAYES_00”, and my SIEVE rule was “if X-Spam-Status contains yes, move to Junk”. The documentation was updated too. Next step will be to allow direct SPARQL queries to load proxies, as I don’t intend to hide every SPARQL feature under the API (yes, I do think developers can learn SPARQL, come one, it’s easy).